Professional Employer Organizations (PEOs) provide human resources services to their small business clients—paying wages and taxes and providing compliance assistance with myriad state and federal laws and regulations. In addition, PEOs often provide workers with access to 401(k) plans, health, dental, life insurance, dependent care, and other benefits not typically provided by small businesses. Between 2 and 3 million people are covered by PEO arrangements. Businesses today seek help with increasingly complex, employee-related matters such as health benefits, workers compensation, payroll, tax and human resource compliance, and management of unemployment claims. They contract with a Professional Employer Organization (PEO) to assume these responsibilities and provide expertise in human resource management. This allows the PEO client to concentrate on the operational and revenue-producing side of its operations, and get back to the basics of their business. PEOs develop lasting relationships with their clients. Due to strong client satisfaction, PEOs enjoy a nearly 86 percent client retention rate. Professional employer organizations (PEOs) enable clients to cost-effectively outsource the management of human resources, employee benefits, payroll and workers’ compensation, So that they may focus their efforts on the core of their business. Any business can find value in a PEO relationship, but the average client of a PEO is a business with 17 worksite employees. Increasingly, larger businesses also are finding value in a PEO arrangement, because PEOs offer robust Web-based HR technologies and expertise in HR management. PEOs can partner with companies that have 500 or more employees and work in conjunction with their existing human resources department. PEO clients include many different types of businesses ranging from accounting firms to high-tech companies and small manufacturers. Many different types of professionals, including doctors, retailers, mechanics, engineers and plumbers, also benefit from PEO services. Once a client company contracts with a PEO, the PEO will then co-employ the client’s worksite employees. In the arrangement between a PEO, a worksite employee and a client company, there exists a co-employment relationship. The PEO assumes much of the responsibility and liability for the business of employment, such as risk management, human resource management, and payroll and employee tax compliance. The client company retains responsibility for and manages product development and production, business operations, marketing, sales, and service. Yes. PEOs operate in all 50 states. Many states provide some form of specific licensing, registration, or regulation for PEOs. These states statutorily recognize PEOs as the employer or co-employer of worksite employees for many purposes, including workers’ compensation and state unemployment insurance taxes. The IRS has accepted the right of a PEO to withhold and remit federal income and unemployment taxes for worksite employees. The IRS has promulgated specific guidance confirming the authority of PEOs to provide retirement benefits to workers. Business owners want to focus their time and energy on the “business of their business” and not on the “business of employment.” Most business owners do not have the human resource training that is necessary to manage a growing company in today’s environment. PEOs help by taking charge of a company’s payroll and accounting, general regulatory compliance, risk management, insurance and employee benefit programs. PEOs give small-group markets access to many benefits and employment amenities they would not have otherwise. It is estimated that 2-3 million Americans are currently co-employed in a PEO arrangement The PEO industry generates approximately $51 billion in gross revenues annually. 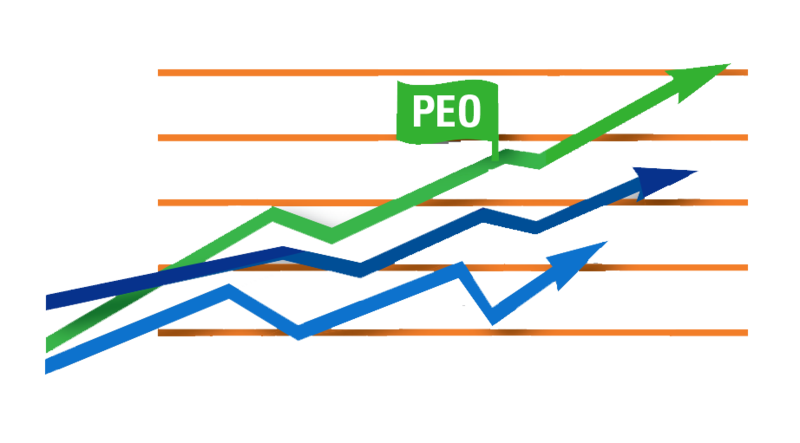 The PEO’s economy of scale enables each client company to lower employment costs and increase the business’ bottom line. The client can maintain a simple in-house HR infrastructure or none at all by relying on the PEO. The client also can reduce hiring overhead. The professionals at the PEO can provide critical assistance with employer compliance, which helps protect the client against liability. In many cases, the client can pay a small up-front cost for a significant technology and service infrastructure or platform provided by the PEO. In addition, the PEO provides time savings by handling routine and redundant tasks for its clients. This enables the business owner to focus on the company’s core competency and grow its bottom line. 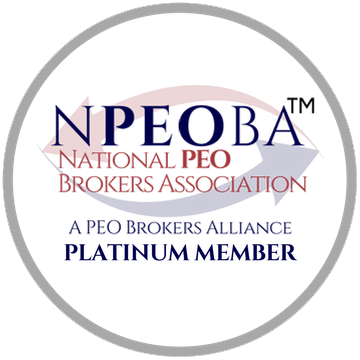 Frequently, a PEO arrangement is the only opportunity for a worker of many small businesses to receive Fortune 500 quality employee benefits like health insurance, dental and vision care, life insurance, retirement saving plans, job counseling, adoption assistance, and educational benefits. Small businesses devoid of a PEO can find it difficult to afford and manage such benefits. PEOs assume responsibility and liability for payment of state unemployment taxes, and most states recognize the PEO as the responsible entity. In those states that require the PEO to report unemployment tax liability under its clients’ account numbers, the PEO can still manage this responsibility. As employers, both the client and the PEO have compliance obligations. However, PEOs provide worksite employees with coverage under many employment laws and regulations, including federal, state, and local discrimination laws, Title VII of the 1964 Civil Rights Act, Age Discrimination in Employment Act, ADA, FMLA, HIPAA, Equal Pay Act, and COBRA. In many cases, these laws would not apply to workers at small businesses without the PEO relationship, since many statutes have exemptions based upon the number of employees in a work force. Once included in the PEO’s workforce, the employees are protected by these laws. Most states recognize the PEO as the employer of worksite employees for purposes of providing workers’ compensation coverage. Like other employers, a PEO may sponsor employee benefit plans for its worksite employees. Such benefits may be mandated by law, such as workers’ compensation and unemployment benefits. Or they may be voluntary benefits that will help attract and retain quality employees, such as health, life, dental and disability insurance. PEOs, as employers may sponsor or acquire programs for their employees. As such, PEOs are consumers of insurance and procure these benefits from licensed insurance agents and authorized insurers.